Historic Harrogate has no shortage of eateries. Shoppers, tourists and Turkish bath goers provide regular footfall, benefitting still by Le Tour’s Grand Departe in 2014 and the BBC Good Food show’s residence at The International Centre later in the month. Our brisk stroll down the hill from the train station confirmed what a foodie destination the town has become, every restaurant window framing packed tables and the clinking of glasses as diners enjoyed a Friday night out. Despite boasting an impressive handful of chains, Harrogate’s Dales blood lies within the independents, one of which being the much loved cafe and surprising slice of Scandinavia: Baltzersens. Famed for their weighty cinnamon buns, Skolebrød laced with cardamon, custard and coconut, traditional waffles and North Star coffee. Baltzersens cafe was dreamt up by ex-army officer and Yorkshire born Paul Rawlinson. The concept was timely and attractive; a homage to Paul’s Norwegian Grandma, blending local fare with the essence of Scandinavian cooking — to preserve seasonal produce through pickles and ferments. Norse’s evening menu opened above Baltzersens three years ago, and following a successful Kickstarter campaign, has a new restaurant on Swan Road just outside the Valley Gardens. There was an assured coolness as we stepped inside, perhaps aided by the natural palette of greys and green, all slate, wood and stone, low ceilings and feature lighting. 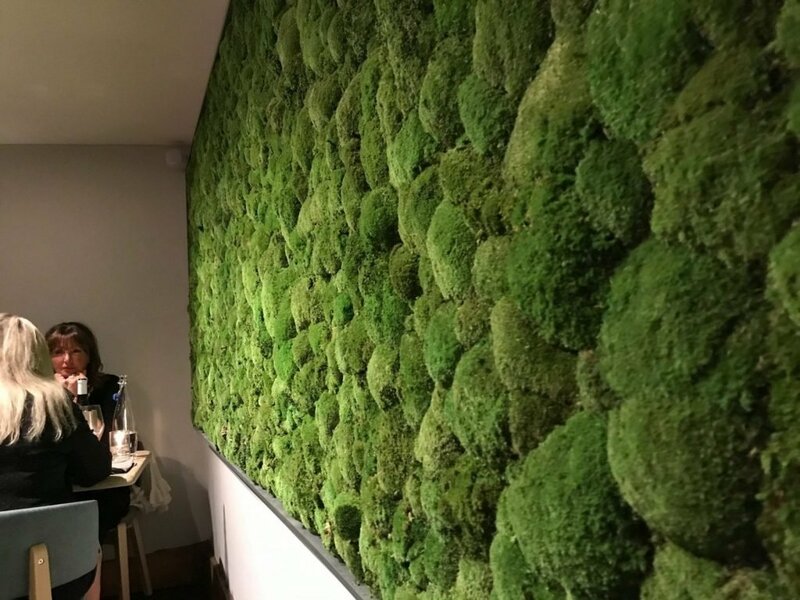 The space was grown up, more minimal than it’s cafe counterpart, with incredible living walls of moss, and an attention to detail that sees furniture from Northallerton and Ilkley complement the very ‘of the moment’ Swedish design. The young team, all in cheque shirts (a little more lumberjack than Norway) pointed us towards the aperitif’s, or ‘snaps’ as we waited for our table. We went for the Pommeau, a short and punchy Calvados and one of their long list of international G&T’s: a Bertha’s Revenge made with Fever Tree, beautifully laced with thyme and dried peel. With our drinks came two delicious cods roe and salmon parcels, served on the smoothest of stones which I nearly by mistake ate, plus moreish celeriac crisps with smoked curd, sat a-top a tiny slate like glassy barnacles by the sea. Excited to move into the dining area, and touch the moss wall, we noted Norse’s delicate balance of texture; an earthy and tactile roundness that flowed through to their cutlery, glassware and ceramics. I remembered enjoying one of their FAQ’s online: “Why haven’t your wine glasses got stems?” after reading Jay Rayner had ridiculed Norse’s pretentious website back in 2014 when Masterchef: The Professionals finalist Murray Wilson was in the kitchen. I’m not sure if their website has changed, but their food in this new residence has certainly found its feet. The now head chef Simon Jewitt’s Nordic inspired small plates reminding me of an incredible meal at Neil Bentinck’s Skosh in neighbourhood York. The menu recommended 3-4 savoury plates per guest, and we were presented with a selection of each to taste and share. Continuing with the the fishy theme, we started with charred mackerel, chicory, pickled rhubarb and roe scraps, which was both smoky and fresh. Then a melt in your mouth pork cheek with mustard glazed artichoke and pumpkin seed puree, which was just as vivid green but not at all as bitter as the pumpkin seed butter that you may have had jarred before. Then came a circle of tender lambs shoulder, jewelled with slivers of fennel, cultured cream and shining beetroot — the flavour of which felt very Scandinavian, along with unusual flecks of oat. Beside this was perhaps the most talked about dish at the table, the comforting and retro duo of hassleback potatoes with Keen’s cheddar and broccoli, which just encapsulated Hyyge with every soft bite. From the Larger Plates we had the no larger, but infinitely richer yeast glazed short rib, which went perfectly with my stemless glass of 2014 ‘Les Volcans’ Pinot Noir. The waitress told us the accompanying dauphinoise-esque Jansson’s Temptation, would traditionally be layered with anchovy but they’d used a smoked eel to mix things up a bit; a bold and informed choice, which seemed to sum up Norse’s contemporary aesthetic. Over a turbot and asparagus dish was poured a decadently flavoured mussel sauce, something I wanted to bathe in, and if this wasn’t enough we were then offered two wonderful puddings. When it came to dessert, I wasn’t so willing to share the beautifully presented chocolate ganache, which was lighter and more moussey than a dark ganache, brought to life by a hint of blackcurrent and a tangy buttermilk sorbet. Roasted buckwheat was sprinkled a like nutty sawdust, and the micro herb garnishing the blackcurrent purée made a pleasing little cherry on top. Fruitier still was the deconstructed Skyr cheescake with gin soaked strawberries, sorbet and tonka bean meringue, which one diner suggested should just be bagged up and sold on the way out. Norse isn’t big, but the menu is outstanding. With 62 covers booked in for opening night it’s sure to do well in Harrogate, especially pulling from Baltzersens’ dedicated following. 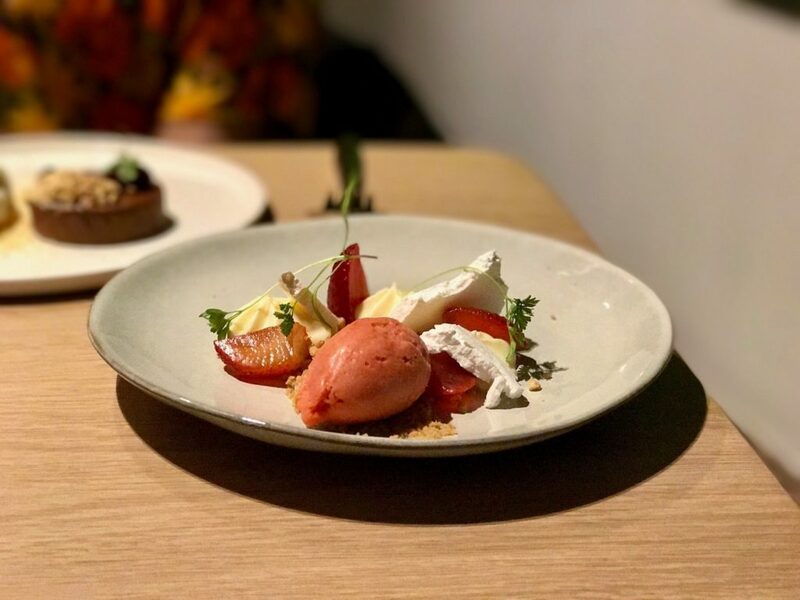 Jewitt, Rawlinson and the team have hit on an really stylish concept with its fusion of Scandi ancestry and local producers, and food that is as rich as it is pickled. I’m fairly sure in time they will have carved their way through Nordic rock into one of the pinnacles of Yorkshire’s flourishing food scene.